Example of a modern cartoon. 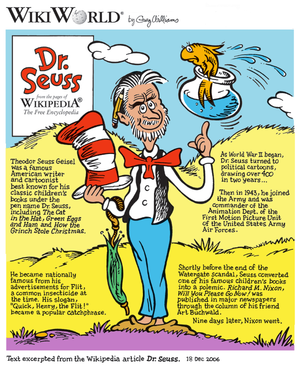 The text was excerpted by cartoonist Greg Williams from the Wikipedia article on Dr. Seuss. The concept originated in the Middle Ages, and first described a preparatory drawing for a piece of art, such as a painting, fresco, tapestry, or stained glass window. In the 19th century, beginning in Punch magazine in 1843, cartoon came to refer – ironically at first – to humorous illustrations in magazines and newspapers. In the early 20th century, it began to refer to animated films which resembled print cartoons. A cartoon (from Italian: cartone and Dutch: karton—words describing strong, heavy paper or pasteboard) is a full-size drawing made on sturdy paper as a study or modello for a painting, stained glass, or tapestry. Cartoons were typically used in the production of frescoes, to accurately link the component parts of the composition when painted on damp plaster over a series of days (giornate). Such cartoons often have pinpricks along the outlines of the design so that a bag of soot patted or "pounced" over a cartoon, held against the wall, would leave black dots on the plaster ("pouncing"). Cartoons by painters, such as the Raphael Cartoons in London, and examples by Leonardo da Vinci, are highly prized in their own right. Tapestry cartoons, usually colored, were followed with the eye by the weavers on the loom. John Leech, Cartoon no.1: Substance and Shadow, 1843, satirized preparatory cartoons for frescoes in the Palace of Westminster, creating the modern meaning of "cartoon". In print media, a cartoon is an illustration or series of illustrations, usually humorous in intent. This usage dates from 1843, when Punch magazine applied the term to satirical drawings in its pages, particularly sketches by John Leech. The first of these parodied the preparatory cartoons for grand historical frescoes in the then-new Palace of Westminster. The original title for these drawings was Mr Punch's face is the letter Q and the new title "cartoon" was intended to be ironic, a reference to the self-aggrandizing posturing of Westminster politicians. Modern single-panel gag cartoons, found in magazines, generally consist of a single drawing with a typeset caption positioned beneath, or—less often—a speech balloon. Newspaper syndicates have also distributed single-panel gag cartoons by Mel Calman, Bill Holman, Gary Larson, George Lichty, Fred Neher and others. Many consider New Yorker cartoonist Peter Arno the father of the modern gag cartoon (as did Arno himself). The roster of magazine gag cartoonists includes Charles Addams, Charles Barsotti, and Chon Day. Bill Hoest, Jerry Marcus, and Virgil Partch began as magazine gag cartoonists and moved to syndicated comic strips. Richard Thompson illustrated numerous feature articles in The Washington Post before creating his Cul de Sac comic strip. The sports section of newspapers usually featured cartoons, sometimes including syndicated features such as Chester "Chet" Brown's All in Sport. Editorial cartoons are found almost exclusively in news publications and news websites. Although they also employ humor, they are more serious in tone, commonly using irony or satire. The art usually acts as a visual metaphor to illustrate a point of view on current social or political topics. Editorial cartoons often include speech balloons and sometimes use multiple panels. Editorial cartoonists of note include Herblock, David Low, Jeff MacNelly, Mike Peters, and Gerald Scarfe. Political cartoons are like illustrated editorial that serve visual commentaries on political events. They offer subtle criticism which are cleverly quoted with humour and satire to the extent that the criticized does not get embittered. Cartoons such as xkcd have also found their place in the world of science, mathematics, and technology. Cartoons related to chemistry are, for example, the Wonderlab, which looked at daily life in the lab. In the U.S., one well-known cartoonist for these fields is Sidney Harris. Not all, but many of Gary Larson's cartoons have a scientific flavor. Books with cartoons are usually magazine-format "comic books," or occasionally reprints of newspaper cartoons. In Britain in the 1930s adventure magazines became quite popular, especially those published by DC Thomson; the publisher sent observers around the country to talk to boys and learn what they wanted to read about. The story line in magazines, comic books and cinema that most appealed to boys was the glamorous heroism of British soldiers fighting wars that were exciting and just. D.C. Thomson issued the first The Dandy Comic in December 1937. It had a revolutionary design that broke away from the usual children's comics that were published broadsheet in size and not very colourful. Thomson capitalized on its success with a similar product The Beano in 1938. Because of the stylistic similarities between comic strips and early animated movies, cartoon came to refer to animation, and the word cartoon is currently used in reference to both animated cartoons and gag cartoons. While animation designates any style of illustrated images seen in rapid succession to give the impression of movement, the word "cartoon" is most often used as a descriptor for television programs and short films aimed at children, possibly featuring anthropomorphized animals, superheroes, the adventures of child protagonists or related themes. In the 1980s, cartoon was shortened to toon, referring to characters in animated productions. This term was popularized in 1988 by the combined live-action/animated film Who Framed Roger Rabbit, followed in 1990 by the animated TV series Tiny Toon Adventures. ^ Constable 1954, p. 115. ^ Adelson 1994, p. 330. ^ Punch.co.uk. "History of the Cartoon". Archived from the original on 2007-11-11. Retrieved 2007-11-01. ^ Adler & Hill 2008, p. 30. ^ Bishop 2009, p. 92. ^ Maslin, Michael (May 5, 2016). "The Peter Arno Cartoons That Help Rescue The New Yorker". The New Yorker. Retrieved 2018-09-16. ^ a b Press 1981, p. 34. ^ Chris Upton. "Birth of England's pocket cartoon". The Free Library. ^ a b Rowson 2015. ^ Adler & Hill 2008, p. 24. ^ Adler & Hill 2008, pp. 49–50. ^ Morris & Tenniel 2005, p. 344. ^ M. Keith Booker (2014). Comics through Time: A History of Icons, Idols, and Ideas [4 volumes]: A History of Icons, Idols, and Ideas. p. 74. ^ Walasek 2009, p. 116. ^ Wells 2008, p. 41. Becker, Stephen D.; Goldberg, Rube (1959). Comic Art in America: A Social History of the Funnies, the Political Cartoons, Magazine Humor, Sporting Cartoons, and Animated Cartoons. Simon & Schuster. Walasek, Helen (2009). The Best of Punch Cartoons: 2,000 Humor Classics. England: Overlook Press. ISBN 1-5902-0308-9. Wikimedia Commons has media related to Cartoons.